The Snake River flows slowly. From this vantage you can make out the tail end of the Tetons Mountain range. A foot bridge crosses one of the many mountain streams that run through the Smoky Mountains. Constructed in 1930, students produced corn meal and other food stuffs for Berry Schools. The waterwheel is over 42 ft. in diameter making it one of the Nations largest overshot waterwheels. Mary Hall, completed in 1931, is a U-shaped building of stone named for Henry Ford's mother. The building features a central square tower with battlements and a pointed arch entrance. Used as a women's dormitory, the building accommodates up to 300 women. Big Spring Park is located in downtown Huntsville, Alabama. The park is built around its namesake "Big Spring", the original water source that the city of Huntsville was built around. 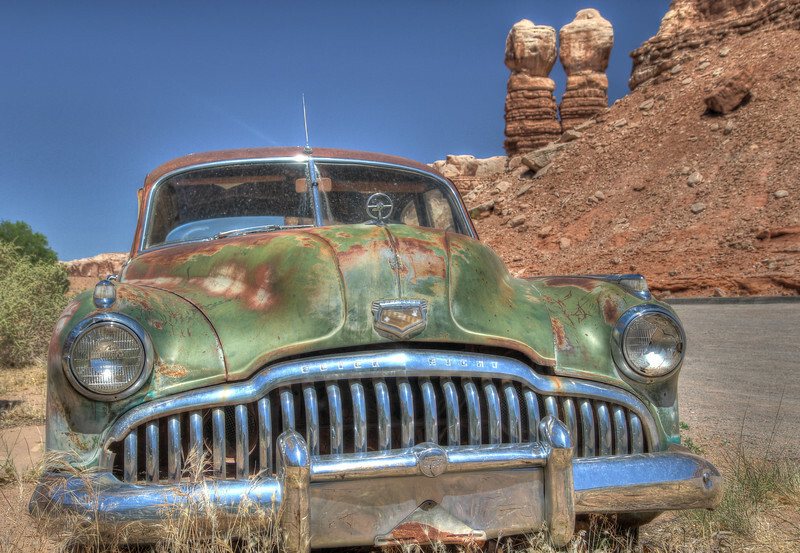 A Buick sits along the road with the Twin Rocks rising from the background. At Cow Canyon Trading Post in Bluff, Utah. The entrance to Yellowstone NP. The statement over the arch "FOR THE BENEFIT AND ENJOYMENT OF THE PEOPLE" prepares you for what lies ahead. Of course they could have have shorted it to "Utterly Amazing"!